Marijuana is now legal for recreational use in 9 states and the District of Columbia. Medical marijuana is legal in an additional 29 states. Legal marijuana is a $10B industry in North America and is growing at 33% annually. By 2021, the industry is expected to more than double to $24.5B. In today’s blog, we’ll discuss: (1) Why effective merchandising is so extraordinarily important in the marijuana industry, (2) The keys to success in creating cannabis displays and developing an effective merchandising program, and (3) What to look for in a POP display/merchandising solutions partner to ensure success. Effective merchandising at the point of sale has always been hugely important in the retail industry, but it’s particularly important in the marijuana industry. Here’s why. First, unlike many other products, cannabis sales are made exclusively through physical stores rather than a combination of brick-and-mortar and online channels. The implication is product manufacturers better get it right at the point of sale since there is no cushion to rely on from online sales. Second, the market is still in its early stages so consumer brand preferences have yet to be established, and the opportunity to win customer loyalty is largely still up for grabs. Third, because of its relative immaturity, the industry is highly fragmented with a multitude of new entrants, significant new product development, and relatively low barriers to entry which is creating a level of competitive intensity characteristic of “the gold rush.” Effective merchandising can help product manufacturers rise above the industry noise. Fourth, parts of the cannabis industry have commodity-like properties, such as the industrial hemp market, and may be viewed by consumers as just another agricultural commodity like corn or wheat. Helping consumers understand the variations in strains, potency, and flavors, for example, is an essential need that can be met through effective merchandising. Fifth, merchandising has an important role to play in demystifying cannabis and enabling consumers to make the emotional and intellectual transition from marijuana as an illegal, underground product to a more mainstream consumer product. Finally, effective merchandising is important as a means to enable industry participants to establish at competitive advantage. 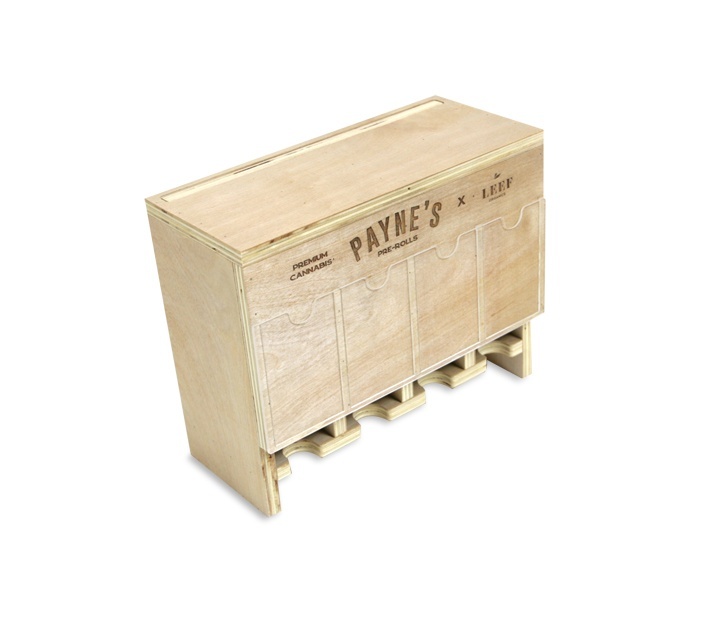 There has been a tremendous focus on product development and packaging in the industry to date, but most players do not understand the basics, the benefits, and the keys to effective merchandising. Product manufacturers who nail merchandising will have a clear leg up on the competition, hence its importance as a competitive differentiator. Recognizing that cannabis, cannabis derivative products, and peripheral products require an educational sale is the first step toward effective merchandising. Why? Well, these products were very recently legalized in a limited number of states, and there are still a lot of questions regarding issues like safety, efficacy, applications, etc. The body of research in the field of cannabinoids is still somewhat lacking, particularly in terms of longitudinal studies. In addition, there are many different varieties, including a wide range of strains, potencies, flavors, producers, delivery mechanisms, etc.). Given the rate of new product proliferation and product choice, it can be very confusing for consumers. Clear messaging can take the form of compelling graphics with key bullet point take-aways, or perhaps the messaging can be conveyed in a short video played on a digital media player that is incorporated into the display. 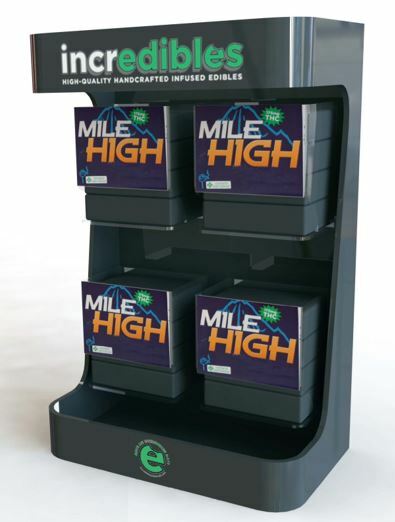 It is critical that a design for a cannabis display takes into consideration the range of distribution channels through which the product will be sold. For example, Vape Shops, Paraphernalia headshops/smoke shops, and dispensaries are likely to have different display needs, space constraints, and customer sets than more traditional retail channels like food, drug, convenience, mass, and specialty retail such as surf, skate, etc. Because of the different requirements across these channels, product manufacturers may need to create a broader range of displays to be able to meet the needs of these diverse channels. 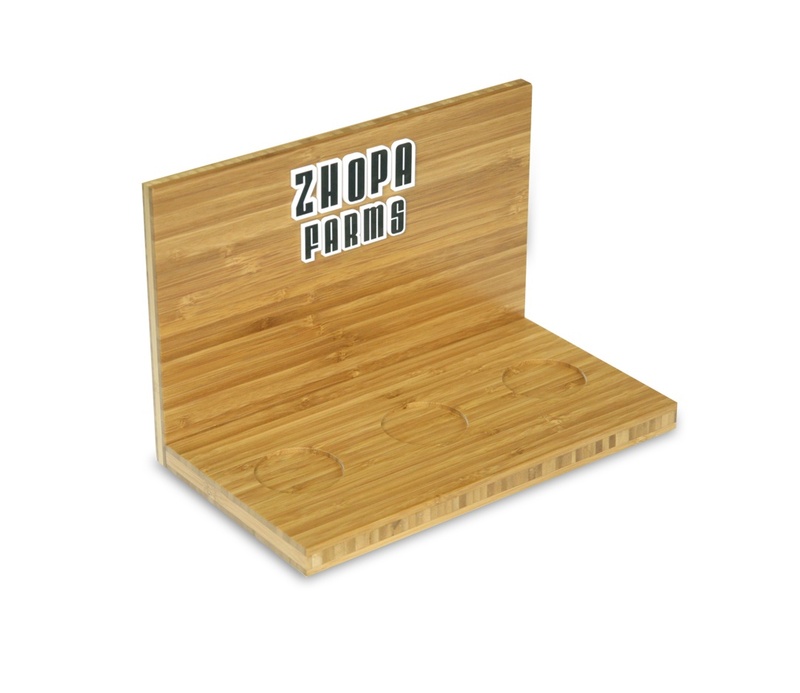 Small footprint, simple displays like 3-jar bamboo display we designed for Zhopa Farms may work well in small shops but may make less sense for larger format stores. There is a strong argument to be made that cannabis is a destination purchase. However, there is an equally strong argument to be made that there is a big opportunity to create displays that trigger impulse purchases. 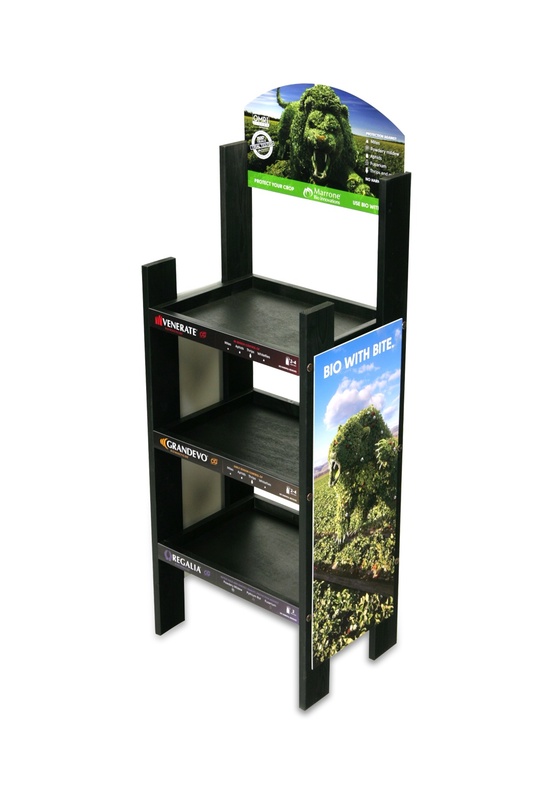 Not only is placement of the display important to create impulse purchases, but orienting a display’s graphics, messaging and basic planogram to encourage trial and impulse purchases is one of the best ways to drive sales and gain new customers. While likely to be less promotionally driven than the wine and spirits industry, for example, there will continue to be numerous opportunities to induce trial and experimentation. That will require both effective marketing and good display design. We touched on this in point number 1 above, but lifestyle graphics that connect emotionally with consumers, strong brand-building graphics, and tasteful displays are likely to have the best chance at winning over consumers. A lot of cannabis companies are taking lessons from successful consumer products companies when it comes to packaging, but the same learning needs to be applied to displays. In addition to graphic excellence, there are a number of ways to create displays that portray quality and are visually appealing, such as incorporating LED lighting or light boxes, 3D laser-cut letters to create higher-end better brand imaging, and digital media which can help to tell a story and educate customers. Visually interesting and graphic-intensive displays like we created for Marrone Bio can help to attract customers and pique their interest. We grouped the last two success factors together since they are important but not unique to the cannabis industry. Small footprint displays help retailers score well on metrics such as sales per square foot. And, as a practical matter, dispensaries, vape shops, head shops, convenience stores, and many specialty retailers tend to be space constrained so packing as much product into a small space will result in greater success in placing displays. An example is the gravity-fed rolling paper display we designed below (shown without the graphics in the acrylic sleeves). Finally, it is worth giving careful consideration to the issue of product access and theft when designing a cannabis display. Products that sit in locked cases may be secure but can also deter sales. On the other hand, CBD oils and a number of other cannabis products are often high-value and can easily be pocketed if left unattended. The right approach will ultimately depend on the product and the retail setting, but the issue of product shrinkage should always be factored into any cannabis display design. Pick a POP company that has a strong design portfolio and a track record of designing and implementing displays that incorporate a broad range of materials and design components such as LED lighting, digital media players, etc. Firms that have a track record across a broad range of industries are likely to be good partners because or the range of experience that comes by virtue of working with different products, distribution channels, retail formats, etc. Experience in the cannabis industry can be a benefit, but having breadth of experience is likely to be of higher value. Look for an entrepreneurial POP company that is responsive and can turn designs quickly. The industry is moving very quickly so a large bureaucratic partner would likely be the wrong choice. An ideal partner would have in-house design capabilities and strong manufacturing/supply chain capabilities. This will speed the time to market and help to avoid cool designs that are not manufacturable. Finding a POP company that has both domestic and overseas manufacturing capabilities can offer the dual benefits of moving quickly and capitalizing on lower production costs for longer runs.